This morning, January 6, the New Mexico History Museum/Palace of the Governors will host a First-Day-of-Issue event on behalf of the U.S. Postal Service and its New Mexico Centennial stamp. That we’re kicking off a year of Centennial activities at the History Museum with a stamp-related event delights my historian sensibilities by inviting New Mexico’s citizens to take part in a letter-writing project. To tell the stories of our past, historians gather information from many sources. They use photographs, documents, and artifacts, like the 47-star flag now on display downstairs in the New Mexico History Museum. But what they treasure more than anything are journals and letters – written accounts of what was happening just as it was happening and told by participants in the events. As we prepared to mark the Centennial in our exhibitions with an installation called 47 Stars, we discovered that the historians who preceded us had left out some of the accounts we would have loved to use. That got us wondering about what we’re leaving for the people who will one day mark New Mexico’s 200th year as a state. These days, hand-written accounts of our lives are in short supply. We all rely on e-mails to communicate, but I bet few of us print them out and save them in a box under the bed. Many of us mark the mileposts of our lives with short Facebook updates that go – where? Who knows? Some historians say all this electronic communication will provide a bounty of material for future historians. Others say something will be sorely missing, that holding a letter written by a person who participated in the historic events as they happened and reading the thoughts they considered important enough to put on paper is truly what makes people connect across generations and throughout history. Lew Wallace finished writing the novel Ben Hur while he was a Territorial governor in New Mexico, and he left this account of what it was like to work on the book inside the Palace of the Governor’s thick adobe walls. My custom when night came was to lock the doors and bolt the windows of the office proper, and with a student’s lamp, bury myself in the four soundless walls of the forbidding annex. Once there, at my rough pine table, the Count of Monte Cristo in his dungeon of stone was not more lost to the world. The ghosts, if they were ever about, did not disturb me; yet in the hush of that gloomy harborage, I beheld the Crucifixion, and strove to write what I beheld. I can feel the surface of his rough pine table. I can imagine the chill of a supposed ghost when a viga creaked or loose page fell to the floor. Those are special details to historians and help us bring the past to life. Each of us has a gift to leave for tomorrow’s historians: A written account of our lives today. So all of us at the New Mexico History Museum have a radical proposal: Write us a letter. That’s it. Just a letter. Tell us a bit about what your life in the year 2012 is like. Update: The letter need not be hand-written if you’d rather print it out. Describe your house, your neighborhood, the businesses you like to visit and why. What games do you play? Where do you go to enjoy the outdoors and what does it look like today? What kind of job do you have and what’s the status of that industry? What do you worry about? What gives you hope? 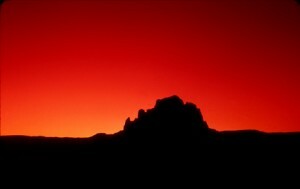 What is it about New Mexico that makes it your home place and heart place? Fold it up, put it in an envelope, address it, and then mail it – maybe using one of those beautiful Centennial stamps. We’ll collect them and share them throughout the year but, most important, we’ll put them into a safe place to spend a few decades gaining perspective. When 2112 rolls around, New Mexico’s historians will delight in the treasure trove you helped create. Send your letters to: Centennial Letter Writing Project, New Mexico History Museum, 113 Lincoln Ave., Santa Fe, NM, 87501. On Friday morning, January 6, the New Mexico History Museum will teem with stamp geeks (a term we use with sincere fondness and respect) as the US Postal Service holds its First-Day-of-Issue ceremony for the 44-cent “forever” Centennial stamp. 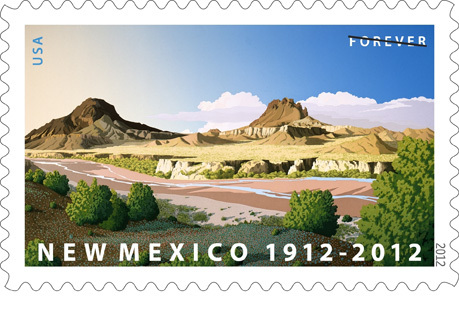 Honoring New Mexico’s 100th year as a state, the stamp features Sanctuary, a painting by artist Doug West that shows off a prototypical New Mexico landscape. Or at least it’s prototypical if you’re a volcanologist, which, it turns out, Larry Crumpler is. And not just any volcanologist. Crumpler is the research curator for volcanology and space science at one of our sister institutions, the New Mexico Museum of Natural History and Science in Albuquerque. He was also part of the NASA team that developed and oversaw the Mars Exploration Rover and, in return, had a feature on that planet named after him: Larry’s Lookout (take a virtual ride toward it here). Despite those stellar creds, Crumpler insists that he had no part in helping the Postal Service choose two of what he considers “the more scenic volcanic necks” in New Mexico — or in the world. Some of the news stories have said the painting features Cabezon, that flat-topped volcanic plug you see between Bernalillo and Cuba, NM. In fact, Cabezon is hidden behind them. The painting features Cerro de Santa Clara (the one on the left) and Cerro Guadalupe (the one on the right). “Both are the shallow interiors of relatively young volcanoes of the Mount Taylor volcanic field exposed by the back-wasting erosion of the Rio Puerco,” Crumpler said. “The Rio Puerco volcanic necks of New Mexico are among the best exposures of the interiors of small volcanoes in the world. 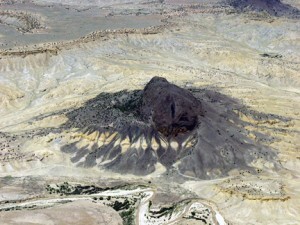 Aerial view of Cerro de Santa Clara, by Larry Crumpler. 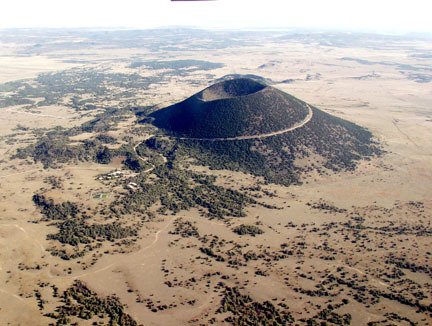 At one time, say, 2 million years ago, the cones were part of the Mount Taylor volcanic field, where numerous small volcanoes burbled and burped around the towering mountain. The Rio Puerco eventually cut through the field and helped erode all the soft material surrounding the lava ponds inside the volcanoes, leaving the little bumps we see today. Cerro de Guadalupe at sunset, by Larry Crumpler. Today, if you walk up to the edge of Cerro de Santa Clara, you’ll see the actual crack that the lava came out of, surrounded by the ash and tuff it left behind. You’ve already seen plenty of volcanic tuff if you’ve been to Bandelier National Monument — though it’s a different remnant of a far more violent volcano. When the Valles Caldera exploded about 1 million years ago, it emitted a blanket of ash, much like a certain Icelandic volcano far more recently did. By the time it settled into a geologic formation, the Valles Caldera ash cloud had mixed with enough other substances to create a surface that after a few more millennia of erosion was deemed perfect living quarters for ancestors of today’s northern New Mexico pueblos. Aerial view of Capulin Volcano, by Larry Crumpler. 1. Drive to the top of Capulin Peak, an old volcano between Clayton and Raton. 2. See lava flows that he considers better than Hawaii’s at El Malpais National Monument. And if you’re hoping to see a volcano come to life while you’re there, prepare to wait. At 7 pm on Thursday, March 29, Crumpler will speak on “Icons of New Mexico: Volcanoes and the New Mexico Centennial Stamp” at the Natural History Museum, 1800 Mountain Road N.W. in Albuquerque. Tickets cost $6 ($5 members, $4 students). Ensure you get a seat by logging onto www.NMnaturalhistory.org or purchase tickets at the door before the talk.